WELCOME TO BC PLACE STADIUM! Welcome to BC Place stadium, home of the BC Lions of the CFL. The following Gameday Information Guide is designed to ensure your experience at BC Place is enjoyable from start to finish! Wheelchair seating is available at various viewpoints throughout Level 2. All suites are also wheelchair accessible. Wheelchairs may be stored at the Stroller Parking located at Section 225. All stadium entrances are wheelchair accessible, and a dedicated accessible entrance is located on Pacific Boulevard underneath Gate F at section 143. A Shuttle is available from parking lot 457 to assist guests in getting to the Sec 143 Entrance. A shuttle to your seat, wheelchair services, and other mobility assistance services are available upon request – stadium staff are here to help! One attendant ticket is available with each wheelchair ticket purchased for the Accessible platforms to ensure all other guests with mobility restrictions can be accommodated. In order to accommodate groups larger than two, please speak with your Ticketmaster representative, when purchasing. Let them know how many people are in your party, and the Ticketmaster agent will work with you to seat your party as close as possible. Alcohol policies are in place to ensure all guests have a great and memorable time during their visit. For those who would like to consume alcoholic beverages, they are available at concession stands throughout the venue, as well as portable beverage stands. BC Place reserves the right to refuse alcohol service to any guest. Guests who appear under the age of 30 will be required to show valid ID. Guests serving alcohol to minors will be subject to arrest. Draught beer will be served to a maximum of 24 oz. per person, per transaction. Alcohol may not be brought into the stadium. Guests attempting to bring alcohol into the stadium will be denied entry or removed. Any guest that is denied entry or removed for any violation of facility rules will not be issued a refund. BC Place and the BC Lions encourage all fans to please drink responsibly, and only use safe modes of transportation when leaving the venue. Only certified service dogs or service dogs in training will be allowed into the stadium. Changing stations are located in washrooms throughout the stadium. There are also parent and gender neutral rooms available on Level 2. Bags (including briefcases, satchels, containers, etc.) larger than 14’’x 14’’x 6’’ are not permitted into the stadium. Special considerations will be made for guests with special medical needs and parents caring for infants. All spectators are subject to a patdown upon entry into BC Place, and all bags smaller than 14’’x14’’x6’’ will be inspected prior to entry. For ease of access, Fans are encouraged not to bring bags to the stadium. Special considerations will be made for guests with special medical needs and parents caring for infants. The Bike Valet located outside BC Place between Gates C and D will offer Fans the option of checking their oversized bag on a first come, first serve basis. Please note that space at the bag check is limited and there is a suggested $5 donation for this service. BC Lions and BC Place accept no responsibility for missing or damaged bags. If you need to temporarily store an oversized bag (larger than 14” x 14” x 6”), you will have the option of leaving your bag temporarily with The Bike Valet outside BC Place, between Gates C & D. Please note that space at the bag storage is limited, available on a first come, first serve basis. There is a suggested $5 donation for this service. BC Lions and BC Place accept no responsibility for missing or damaged bags. Empty refillable plastic water bottles are permitted into the stadium and are subject to search at the gate. Bottles can be filled at drinking fountains located on the main concourse. Bottled water can also be purchased from concessions. Safe and secure bicycle parking is provided by The Bicycle Valet (thebicyclevalet.ca), located outside BC Place, between Gates C and D. Bike valet service is available from gate opening time to a half hour after the final whistle. Personal photography is permitted in stadium, provided the images are for personal use only. Photographic support tools (tripods, professional lenses larger than 150 mm) that may interfere with others’ enjoyment of the match are not permitted in the stadium. Selfie sticks are not permitted. Children age two and under will be admitted free as long as the child is sitting on an adult’s lap. If a parent requests a physical seat for the child, he/she must purchase a ticket. BC Place is committed to providing a safe, comfortable and enjoyable experience for its guests. Guest conduct must be legally appropriate, respectful and not be offensive/abusive to other guests and those working at the event. If you need assistance during the game call 604-661-3434, email: guestservices@bcplace.com or send a tweet to @BCPlace. Centerplate, the food service provider at BC Place Stadium, offers a wide variety of meal choices in the concession stands from your classic hotdog, burger and fries to Vij’s curries, short rib poutine, house-smoked meat sandwiches, bacon wrapped hot dogs and house made soups and panini. The culinary team takes pride in producing items like chili, butter chicken, sushi, panini, soups, and salads in-house utilizing local products. BC Place is a non-smoking facility. As such, smoking is not permitted inside the venue, or on the stadium’s plaza. The use of E-Cigarettes and Vaporizers is not permitted while inside the Stadium. First Aid Stations and rovers are located throughout the concourse on level 2. If you require assistance for any reason, including First Aid, please speak with the BC Place staff member nearest your location. If you lose (or find) an item during the match, please report the loss (or bring the found item) to Guest Services at Section 234 on level 2. Parents looking for a lost child should report to the Guest Services booth located at Section 234 on level 2 as soon as possible. Official BC Lions merchandise is available on the concourse inside BC Place Stadium at sections 205, 212, 222, 233, 249, and at the Southwest Club Lounge on level 3. BC Place accepts Cash and Credit Cards at most locations. Some locations such as portable concessions accept Cash Only. As part of the improvements to the speed-of-service, debit payments are no longer available at food and beverage concession stands. For guests who require debit as a payment method, ATM machines are located on the concourse at sections 212, 216, 225, 235, 246 and 250, on suite level at section 343, and in the food court at section 112. All ticketing and merchandise locations throughout the stadium continue to accept debit, credit card and cash. Outside food or drink is not permitted into the stadium. Special considerations will be made for infants (i.e. bottles and unopened baby food), and for medical reasons. Any outside food or beverage will have to be consumed or disposed of before entering the venue. Pay parking is available in multiple lots close to the stadium. Accessible parking is available on a first-come, first-served basis at the Impark Lot 457 off Pacific Boulevard. Please be aware that bags will be subject to inspection upon entry. The following items are prohibited: alcoholic beverages, glass bottles, cans, cameras measuring more than 6 inches in length with lens attached, selfie sticks, food products, professional recording devices (video and audio), weapons, laser pointers, pressurized air-horns, and any other items illegal or deemed to be a risk. Persons possessing any of these items may be denied entry or subject to removal. Exceptions may be made for those with medical requirements and/or special requirements. Persons denied entry or removed for any violation of facility rules will not be issued a refund. Bags larger than 14’’x 14’’x 6’’ are not permitted into the stadium. Small bags are subject to search prior to entering the stadium and guests are subject to pat down searches for event entry. These measures include, but are not limited to a more thorough search of persons and property including a more thorough pat down procedure. Due to these safety and security procedures, we strongly recommend early arrival to BC Lions games. Any individual who throws, tosses, or otherwise projects any object in the stands, onto the pitch, or in the direction of another spectator, will be immediately removed from the stadium. Thrown objects will become the property of the BC Lions and will be returned to their owner only at the sole discretion of the Club and BC Place. There are no in/out privileges. Exit and re-entry is not permitted. BC Place is a smoke-free facility. Smoking of any kind (including e-cigarettes) is prohibited on stadium property including external plazas. There are no designated smoking areas. There are no in and out privileges once inside the stadium except for emergency purposes. The position of the retractable roof – either “open” or “closed” – for the game will generally be determined on game day. Fans can check for updates on game day via the club’s Facebook and/or Twitter handle. BC Place is considered an “open-air” venue, event with the roof closed. Therefore, it’s always best to prepare for an outdoor experience when attending a BC Lions game at BC Place. We encourage you to bring a jacket or sweater on cooler days, and have sunscreen, a hat, and sunglasses with you during the hot summer months! Sunscreen is available for purchase from various concessions. Please ask our friendly stadium staff for locations that will sell sunscreen. Stroller parking is available at section 225. 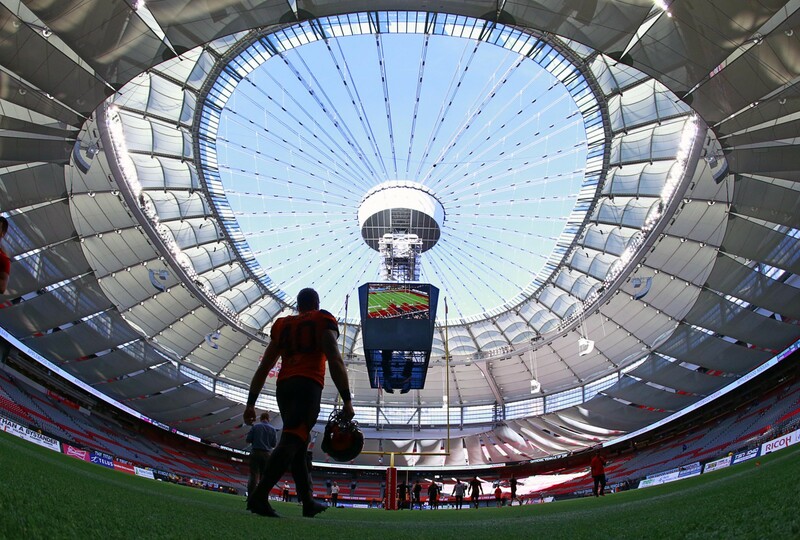 BC Lions and BC Place Stadium are not responsible for any lost or damaged items. If a stroller parking ticket is lost, proof of identification must be provided in order to claim the stroller. Stroller parking is available from gate opening time to a half hour after the final whistle. If no strollers are dropped off, stroller parking will close at halftime. If you are not able to attend a game, and would like to see your ticket help make a positive impact in your community, tickets can be donated to the Kids Up Front Foundation on your behalf so that no seats are left empty. Fans are encouraged to contact the BC Lions Football Club prior to any game to discuss ways your tickets can provide uplifting experiences to children-in-need!